Yogi Surprise is a monthly health and wellness subscription box that sends you natural goodies each month. Some items may be specifically for yoga, but in general, this is more of a lifestyle box. Yogi Surprise also offers a monthly Lifestyle box (read our reviews here!) and a men’s box! This is a review of the Yogi Surprise Jewelry box, which is $24.95 a month. Here is the info sheet for this month’s box. This month’s theme is “Chikitsa,” which literally means “treatment” in Hindi! Sodalite is a blend of magnesium and calcium, and I am loving these naturally occurring blue hues. This is stone is designed to promote spiritual harmony and calmness to help you weather the storms you face. The twenty-four-inch chain it is on is nickel free and plated with silver. 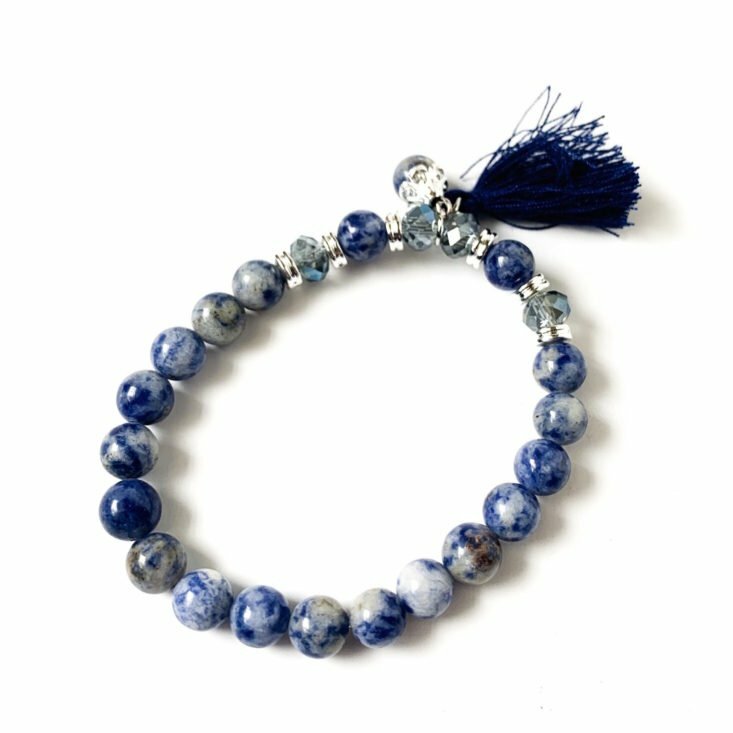 This gorgeous bracelet is the perfect complement to the necklace, featuring solid sodalite beads, crystal rondelles, and silver spacer beads. It has a short navy blue tassel, and honestly, this bracelet is part fashion, part cat toy. This should layer well with other bracelets if you are so inclined, too! This box always includes a treat of some kind, and this month we received some seriously fancy tea bags. Each tea bag is individually wrapped, and I received one Jasmine Silver Tip, one White Petal, and one Rose City Genmacha. I decided to try the Rose City tea first because I love rose, and I loved how this looked once it started steeping. Look at how beautiful it is! This actually didn’t really have much of a rose flavor- the star was the nutty taste from the roasted rice. I also love the cute sayings on the tea bags one suggested we practice the art of Japanese flower arrangements during the 3 minutes it takes to steep. The Verdict: Yogi Surprise always sends fun jewelry, and this month was so exception. I was also happy with the matching pendant and bracelet were the choices this month- there are only so many Malas a girl can use, so it was nice to mix it up. I am not a jewelry or stone expert, but I definitely think these pieces are of good quality. For the $24.95 I am happy with what I received – especially considering all jewelry is handcrafted with fair trade materials. Can you get this box if you sign up today? No, you will receive the April box. Value Breakdown: This box costs $24.95 + free shipping, which means that you’re paying $12.48 per piece of jewelry. Check out all of our Yogi Surprise reviews and the Women’s Subscription Box List! What do you think of this month’s Yoga Surprise Jewelry box? I must admit that I’m a real mala lover, and the quality of most of the Yogi Surprise malas is wonderful. This box was not one of my favorites, but the tea was lovely. I loved these items, especially the bracelet! I received a bonus item (first time subscriber?) – Green pointed pendulum on a silver chain. It appears to be aventurine – no explanation as it just showed up in my March box. It was a nice box for the 25% discount. Looking forward to the tea samples.